Quirky Jessi: LippiSelk-Bag, the wearable sleeping bag - More Snuggie variations? LippiSelk-Bag, the wearable sleeping bag - More Snuggie variations? 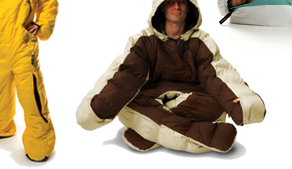 As I was writing my last post, @khorre linked me to these awesomely fashionable sleeping bags. The Lippi Selk'Bags and MususBags are a new wave of sleeping bags that let you "roll with your Selk'Bag, not in it" and "stand without any trouble, walk, cross your legs and arms, thanks to reversible zippers." Surprisingly enough, they come in a few different seasonal models, depending on if you're going to be cross country camping or just snuggling with a good book on the couch. There are several colors and sizes, too (including for kids), so it's actually a pretty cool idea, especially if you do a lot of camping. I'm sure most of us have experienced getting tangled in our sleeping bags while we roll around and try to stay warm or dread climbing out of it in the morning because it's oh-so-cold. And to think, originally I was just going to make fun of it, lol. Now only if it would keep hands warm and allow me to type. it's like an updated, all new and improved snuggie!